Beginning with their stunning debut in 1970 Emerson, Lake & Palmer had steadily drawn more and more music enthusiasts into their camp with every new studio release and supporting tour. With a hit single under their belt from "Trilogy" they were ready to unveil the album that would propel them to the top of the rock heap. Utilizing fantastic, revolutionary cover art by H.R. 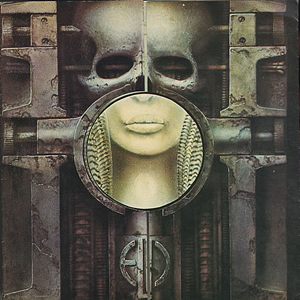 Giger, a 12"x12" full-color folded insert that included individual portraits and millions of dollars worth of ads and marketing salvos from their own label's distributor, Atlantic Records, ELP would change the progressive rock landscape forever with "Brain Salad Surgery." While "Jerusalem" may be as familiar as "Amazing Grace" to Englanders, it's a relatively obscure song in the states so (as far as we were concerned) they may as well have written it themselves. It sure sounds like something they could have penned. Anyway, it's a grandiose opener with Greg Lake's stately vocals and Keith Emerson's terrific organ and synthesizer sounds augmenting a regal melody. This is followed by "Toccata," Keith's arrangement of Ginastera's 1st piano concerto and a fine example of modern composition. It's what ELP does best instrumentally with its tight, intricate segments that weave a dizzying tapestry of musical hues. The first half is excellent, then Carl Palmer performs a tympani solo before he moves to the drum kit. Keeping in mind that in the early 70s synthesizers were still a novelty, the noisy display of annoying electronic sounds still gets to be a bit much before it's over. Next up is Greg's "Still. You Turn Me On," which has the same aura of their previous single, "From The Beginning," but is just as alluring. The lyrics seem to convey that, despite the craziness and intensity of life as a rock star, the singer is still "turned on" by the audience. It's a well-written tune but some of the quirky guitar effects haven't aged well and now sound understandably dated. ELP was notorious for injecting cornball detours from time to time and this LP was no exception. "Benny The Bouncer" is a fluff piece about a ferocious club doorman who finally gets the crap beat out of him and ends up with a hatchet in his head. Not exactly standup comedy material but I guess it was funny to the trio. In their defense the music isn't horrible, the honky-tonk piano work by Keith is authentic and they even throw in a false ending to boot. However, one has to believe that by then they surely had better songs than this meaningless ditty to include. "Karn Evil 9" is the focus of the album and their most adventurous epic. "1st Impression" is nothing short of amazing. Divided into two sections on the LP, the second part is the one that became the most recognizable due to its being ushered directly onto the heavy rotation of FM radio stations all over the free world. I personally prefer the first part but, along with tunes like Yes' "Roundabout" and Pink Floyd's "Comfortably Numb," "Welcome Back My Friends." is one of the essential classic progressive rock songs that keeps the genre on the aural map of the general populace generation after generation. And for that we should be grateful. Greg's guitar work is surprisingly adroit but everyone in the group is performing at the top of their game here as they flawlessly deliver this supercharged segment about computers being introduced as the benign saviors of mankind. "To take their sorrow from this odyssey/to help the helpless and the refugee/to protect what's left of humanity." Lake and Peter Sinfield (of King Crimson fame) contribute brilliant lyrics to describe the resulting amoral scene after the machines have taken over everything, including entertainment. For example, religious sacredness has been debased to a trick as they demonstrate "with our hands behind our backs/we pull Jesus from a hat!/get into that/get into that!" and nature has been ravaged to the point where "there behind a glass/is a real blade of grass/be careful as you pass/move along, move along." Truly disturbing images. "2nd Impression" is Keith's instrumental creation and it is phenomenal. Starting with sublime jazz piano and evolving into an energetic Latin rhythm complete with synthesized steel drums, it's an exhibition of Emerson's immense keyboard talents. After a quieter yet ominous bridge the band breaks into a high-speed piano-led section that will leave you breathless. "3rd Impression" is a return to the rock format with a big dose of dramatic vocalization from Greg. To my ears this is the weakest of the three impressions but only because the first two are so spectacular. There's a rather mundane synthesizer segue before the stirring organ comes back and Palmer's tempo is, shall I say, "variable" at times. The story line here is that the computers now rule mankind, much to the regret and chagrin of human beings and, though there is a rebellion, the machines win in the end. The feeling I get musically is that the band was building up to a huge finale with the concert audience in mind and we'll never know what it might have sounded like if they had followed their muse rather than what they thought the live crowd would want to experience. The saga ends with the computer exclaiming, "I'm perfect! Are you?' and then proceeding to demonstrate its idea of music by performing a programmed pattern that can only repeat itself over and over as it accelerates as fast as it can go before stopping on a dime. In this nightmarish vision of the future human emotion has been purged from art. Emerson, Lake & Palmer would never attain this level of excellence again. The adoration and popularity that came after this album would eventually tear them asunder and cause personality clashes and ego-fueled rifts that would diminish their ability to work together efficiently as a team. But nothing can take this achievement of prog rock away from them (or us) and future music archaeologists will admire it just as much as we do now. It's not a complete masterpiece but it's a landmark nonetheless. 4.4 stars.